Tuna noodle casserole is something that I grew up with, and I still like it. I usually cook completely from scratch, but I don't mind using the original-recipe processed foods to make traditional comfort food like this once in a while. Cook noodles per directions, leaving them a bit undercooked, since they'll be in the oven afterwards. Drain the noodles and in the warm pot add the soup and cream cheese and stir until the cream cheese melts into the mixture. Add the tuna and peas, and stir to break up the tuna as desired. Put the mixture into an oven-safe casserole and top with the grated cheese. Bake at 350 degrees until the cheese is melted and begins to brown and the mixture is bubbly. I like to bake, but my cake decorating skills are lacking. Some of the baking books I own have instructions for creating the sort of flourishes you see on wedding cakes, but that’s not really my style. 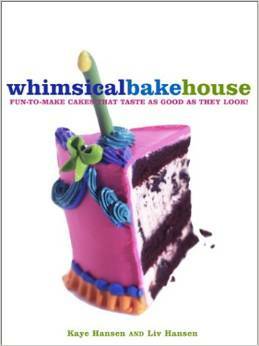 So when I got “The Whimsical Bakehouse,” I was pretty excited to see decorating styles that were more, well, whimsical. I started my adventure with the chapter titled “Simple Cakes” with something called Ode to Jackson Pollack. Before I started on my decorating challenge, I needed a cake, and the Pollack instructions suggested three different cheesecake recipes. I went with the Mocha Chocolate Chip Cheesecake. The base of the cake is a chocolate cookie crumb crust. Use any handy recipe for a chocolate cookie crumb crust, or take a look at my previous post here. Press the crumbs onto the bottom and halfway up the sides of a 10-inch pan. The book specified a 10-inch cake pan, but I didn’t have one that large, so I used a 10-inch springform pan instead. And really, that’s a little less scary when it comes to unmolding a cheesecake. If you do use a springform pan, cover the bottom and up the sides with aluminum foil to prevent water from seeping in during baking. Beat cream cheese with an electric mixer until smooth. Gradually beat in sugar. Simmer the cream, take off the heat, and add the espresso powder and vanilla. Stir until completely mixed. Add the cream mixture to the cream cheese and beat on low speed until incorporated. Add eggs one at a time, at low speed. Beat just until the eggs are fully incorporated. Pour mixture into the prepared pan. 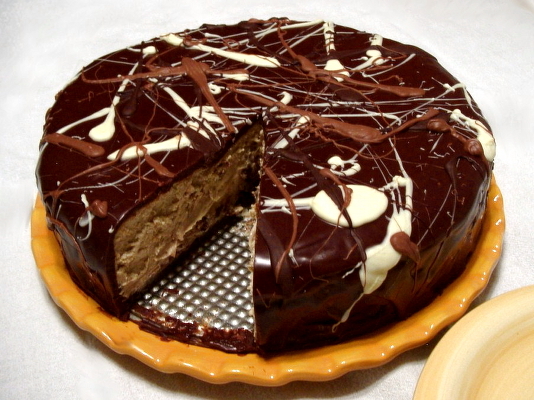 Scatter the chocolate chips over the top and swirl them into the filling with a small knife. Place the pan into a larger pan and fill the larger pan with water to halfway up the sides of the cheesecake pan. Bake for 50 to 75 minutes, or until lightly golden and set. When done, let the cheesecake sit at room temperature for an hour or two before trying to unmold it. Before unmolding, run a knife around the edge to loosen, being careful not to break the crust. Unmold carefully and place the cake onto a cardboard round. Or, if you’ve used a springform pan, just use the springform botton. Freeze the cake until completely set, about 3 hours or overnight. Melt the chocolate in a bowl over simmering water. Warm the cream, butter and corn syrup in a small saucepan over low heat, stirring until butter is melted, and continue heating until just before it comes to a boil. Slowly pour the hot liquid into the chocolate, whisking until smooth. Strain through a fine strainer. This can be cooled and stored in the refrigerator and heated gently before you need to use it. Place the cake on a wire rack over a sheet pan. Pour the glaze over the sides of the cake first, then over the top. Use an offset spatula to smooth and even out the glaze. Shake the sheet pan to settle the glaze. Now comes the fun part. Dip a fork into the melted white chocolate and flick it over the cake to create lines and spatters. Do the same with the dark chocolate. You don’t need to use all the chocolate; stop when you like the effect. Lift the cake from the rack and clean off the bottom edge with a hot spatula. Let the cake chill for 1-3 hours until the chocolate is fully set. Meanwhile, clean the chocolate off all the surfaces where you flung it. The leftover glaze and the drips on the baking sheet can be saved for later use. Just refrigerate and remelt gently. In the April issue of the Left Hand Valley Courier, my "What's Cooking?" column included a recipe for a mocha chocolate chip cheesecake and decorating instructions from the book The Whimsical Bakehouse. The recipe in the book included the instruction for making the cookies that are used to make the crumb crust, but I had to leave that out of the newspaper article because of space. While you could certainly use any commercial cookie for the crust, I think these are a much better choice. They're not as sweet as most commercial cookies, which is good because sugar is included in the making of the crust. These would be fine dipped in chocolate, or with a filling between two cookies, but they're a little plain on their own. While my article in the Courier was all about this particular recipe, the decorating instruction in the book are clear and even better, they're useful. I'll probably never need to decorate a wedding cake, but there are plenty of ideas here for making fun and quirky cakes that I'm likely to want to make. With an electric mixer. beat the butter and sugar to combine, then add eggs and vanilla, beating until well combined. Sift together cocoa, flour and salt, and add these dry ingredients all at once to the butter, and mix on low until combined. Chill for10 minutes, then roll the dough into to logs on a floured surface. Wrap the logs in plastic wrap or waxed paper and chill for 2-3 hours, or overnight. When you're ready to bake, preheat oven to 350 and line a cookie sheet with parchment paper. Slice the logs into pieces about 1/4 inch thick and arrange them on the cookie sheet about 1 inch apart. Bake for 14-18 minutes, or until firm to the touch. Cool on a wire rack. Smash the cookies to crumbs or whizz them in the food processor to make the crumbs. Add the sugar, stir to mix, then add the melted butter and mix well. Press the mixture into your pan firmly...and continue with your recipe. After a hiatus from baking breadsticks, I'm back on that track again. This time it was breadsticks with cheese. If I was making bread or soft breadsticks, I'd normally choose real cheese, but for crispy breadsticks, I thought that a cheese powder was a better choice. I used the same bread recipe as for my frying pan flatbreads, but let the dough rest in the fridge overnight rather than using it right away. I let it sit on the counter for about a half hour while the oven was preheating to 350 degrees. But 325 degrees probably would have been better. I rolled the dough out and coated it with its first sprinkling of cheese powder. This stuff came from Savory Spice Shop in Boulder, and it's not a scary mix of chemicals. The ingredient list is short and understandable. I like that. Photo's a little fuzzy, but not bad considering I was holding the camera with one hand. I folded it much like I'd do for a laminated pastry dough. One fold over. I rolled it out again. Then I sprinkled the cheese powder on and folded in thirds again. I rolled it out for cutting, just like my Sesame Breadsticks, and gave them the same twist. I thought I took photos of this step, but apparently not. Basically, I rolled the dough into a rectangle about 12 x 15 inches and cut it in half lengthwise before cutting the strips. I then stretched and twisted the strips before I put them on the breadstick pans. The dough was still a tad chilly, so it was pretty bouncy and it wanted to untwist. I retwisted some that didn't want to stay put, after all of them were finished and after that short rest they were better behaved. Since these didnt have a topping that needed to stick on, I didn't use the Quick Shine as I did for the sesame breadsticks. Here they are, just as they're going into the oven. They were done in just about 20 minutes, and a few of them were a little more brown than I like. Next time I use the same dough for breadsticks, I think I'd cut the heat to 325 degrees. And one more photo, just for fun. What culture doesn't have a flat, bread-like food? Tortillas, naan, pitas, wonton wrappers, crepes, lefse, pizza, matzo, english muffins, injera, pancakes, lavash, arepas, chapati, funnel cakes... okay, maybe the last one is a stretch. But I've just scratched the surface of the many flatbreads from different regions of the world. You could spend a lifetime perfecting the flatbreads of every culture. Some require special ovens. Some use specialty flours and spices. Some rely on technique. But while all the flatbreads have their special nuances, there are similarities, too. So a failed flatbread of one type could be a perfect flatbread of another type. A flour tortilla that's a little too thick could be a lovely pita bread. A pita that's too big and bready could make a nice pizza base. So if you're experimenting flatbreads, you can't really go wrong. Make them the way you like them, and once you're comfortable with the process you can move along to authenticity. The other great thing about many flatbreads is that the leftovers can be transformed into easy snackfoods. When I have leftover pita-like breads, I cut them into triangles (usually 6 per pita) and I bake them until they're crispy. They're nice little crackers. And you can make them healthier by using some whole wheat flour in the dough, if you prefer. All salsas benefit from a little resting time, to let the flavors meld a bit. These can be made the day before and refrigerated. If you don't want a soupy, drippy salsa, drain the liquid before serving. Leaving it in the salsa while it rests will help the flavors mingle a bit. All of these salsas can be made chunky, finely diced, or blended. If you prefer a smooth salsa, a stick blender is the ideal tool for the job. For any particular ingredient, you can add more or less, or leave it out. It's up to your tastebuds. My goal here was to make three different salsas, all with few ingredients, and to make each salsa with a different main component, color, and type of heat, and to do so without repeating any specific ingredient (except salt) among the three recipes. The instructions for all three salsas is pretty simply. Prepare the ingredients, mix them together, taste for seasoning, and adjust as needed. That's it. Some folks prefer a cooked salsa to a fresh one, and using canned tomatoes and a prepared hot sauce gives this salsa that more mellow cooked taste without the need to do any cooking. Rinsing the diced onions in cool water will keep them crisp while removing some of the bite; rinsing them (or giving them a little soak) in hot water will give them a head start on getting a little wilty, so they seem like they've been cooked at least a little bit. Adobo powder comes in many brands and have varying amounts of salt. After adding the adobo to your liking, adjust the salt level. If the tomatoes are very tart, a little bit of sugar or honey will tame the tartness. You can drain the tomatoes or leave them in their juice - it depends on what you're using the salsa for. And if you like even more of a cooked taste, you can certainly put this into a little saucepan and let it simmer until it's as cooked as you want it to be. 1/4 cup green pepper, diced. I recently discovered the locally-produced Hotheads Pepperspread, but if it's not available where you are, you can use diced canned jalepenos, pickled jalepenos, or fresh hot peppers, adjusted to your taste. The Pepperspread is convenient, though, and it packs a decent amount of heat in a little bit of sauce. The green bell pepper adds an extra bit of green color and a little crunch. Cilantro is always optional. I found a cilantro paste in a tube at the local grocery store, and decided to try it out for this salsa, since fresh leaves would get soggy anyway. If my herb garden was supplying me with cilantro I wouldn't bother with a paste, but the fresh cilantro was a little sad at the grocery store, and I only needed a little bit, so this seemed like a better bargain. I wanted a third salsa, and I didn't want to do the usual mango salsa. Mangoes are so fickle at the grocery store. Once in a while I get a good one, but it's a risk. Canned crushed pineapple makes this one really easy to make. The cucumber adds a little freshness and a bit of crunch. The lime brightens it up, and the ginger adds a kick without being hot in the peppery sense. Right next to the cilantro in a plastic tube was the ginger in a plastic tube. It was a two-fer price, so it seemed like a good idea. Fresh grated ginger would be stronger, and powdered ginger would have a longer shelf life, but this was perfectly convenient. The bake sale will be held on Saturday, May 8 from 10 a.m. to 5 p.m. If you live nearby and you like to bake, consider joining the Cayenne team and baking some items. There's still pleny of time to sign up. If you don't live nearby, you can check out bake sales in your area, or make a direct cash donation. I just got a copy of Michael Symon's cookbook, Live to Cook, and of course I was excited to try some new recipes. And of course, I was thinking that I'd find something to write about for the Left Hand Valley Courier, for my "What's Cooking?" column. I've adapted a lot of baking recipes for the column, so I thought it would be a nice change to make a savory dish. I settled on the Italian Braised Beef with Root Vegetables. It sounded good, the recipe looked simple enough, it didn't require any strange ingredients or special equipment. Better yet, the beef recipe uses celery root, which is a little different, but readily available at our local grocery stores. I like the idea of introducing a new ingredient or method or gadget in my articles, so this recipe seemed perfect. I was about to gather ingredients for the test recipe, until I noticed that the recipe required 2 cups of Yia Yia's Sunday Sauce. A little more reading enlightened me. It's Simon's grandmothers's red sauce. The sauce is the base for several recipes in the book, but Symon wrote, "But of course it's fantastic just served on pasta and topped with torn fresh basil." The sauce is a long-cooking one - eight hours - so it's not like I was going to be making the sauce and the beef the same day.. For a brief moment, I considered substituting something else in the beef recipe, but Symon said that the sauce was critical to the dish. If I'm going to evaluate the recipe, I'd better make it right. I decided to work on sauce and think about the beef later. Since the Courier column has a limited amount of space, I doubt I'd have enough room to write about the sauce and the beef. But, oh, that beef looks tasty. There's no way I'm abandoning that for a simple sauce. So I'll be making the beef later, for an upcoming issue of the Courier. Meanwhile, I made the sauce. This was the first time I ever made a red sauce from a recipe. I learned how to make my mother's sauce, which is a toss-and-taste sort of recipe. This is completely different. In a good way. Makes about 2 quarts of sauce. Heat the oil in a dutch oven or heavy pot. Add the onion and cook until translucent, then add garlic and salt and cook until it is all soft, but not brown. Squeeze the tomatoes one by one into the pan, smashing them well. Add the remaining juice to the pan. Add the rest of the ingredients and bring to a simmer, then reduce to the lowest possible setting and cook for 8 hours. During that time the sauce should reduce by 1/3. Remove beef bones and bay leaf. Taste for seasoning and add salt, if needed. If you're not using it right away, let it cool a bit before you refrigerate it or pack it for the freezer. I used about 2 cups of this sauce for my homemade spaghetti. I've got more in the freezer waiting for more pasta and for the upcoming braised beef. I'm tremendously glad I made this sauce. It's completely different from the family recipe, which made it worth making. It's really meaty, even without any meat remaining in it. And the meaty beef bones that you remove? In my house, that's the cook's treat. Last fall, after an online conversation about HFCS, I took a look at all the condiments in my fridge to see which ones had any. Since I do most of my cooking from scratch, I wasn't worried about what I'd find, but I was curious. Out of everything, the only items I found that listed HFCS on the label were ketchup and sweet pickle relish. Well, okay, I don't use either one excessively, but I figured I'd give homemade versions a try. My attempt at ketchup ended up tasting more like barbecue sauce. So that's still a work in progress. But I was pretty happy with the pickle relish. I actually like it better than the commercial stuff. Adapted from the "Ball Blue Book of Preserving"
Makes 8 half-pints of relish. Combine all the chopped veggies in a large bowl, sprinkle with the salt and cover with cold water. Let it stand for two hours, then drain, rinse, and drain well. Taste for salt level. If it's too salty, rinse and drain again. Combine the rest of the ingredients in a large pot. Bring to a boil, then add the drained veggies. Simmer for ten minutes. Pack the hot relish into prepared jars, leaving 1/4 inch headspace. Removed air bubbles in relish and adjust headspace if necessary. Adjust the caps and process for 10 minutes. (For information about processing home-canned goods in a biling water canner, see my Water Bath Canning post. Recently, I bought a grain mix from King Arthur Flour called Harvest Grains Blend. However, I thought I was ordering something else. What I wanted was the Ancient Grains Flour Blend which includes amaranth, millet, sorghum and quinoa flours. But I didn't realize my error right away. I stashed the bag in the fridge until I wanted to bake with it. I opened the bag expecting to see a flour, but instead, it looked like birdseed. Harvest Grains Blend includes whole oat berries, millet, rye flakes, wheat flakes, flax seeds, poppy seeds, sesame seeds, and midget sunflower seeds. It looked a little crunchier than I wanted, but the bag was open, so I figured that I'd give it a try. It's an interesting combination of nuts and seeds, and it's all whole grains. I put a cup of the mix in a bowl, added a cup of hot water, covered it with plastic wrap and let it sit overnight. I figured that would soften the grains that could soften, and it wouldn't hurt the rest. Put 1 cup Harvest Grains Blend and one cup hot water into the bowl of your stand mixer, cover with plastic wrap, and let sit overnight. The grains will absorb quite a bit of the water overnight. The next day, add the 1/2 cup of lukewarm water, yeast, and sugar. Stir to combine and let it sit for about five minutes to make sure it gets foamy and frothy. Add the rest of the ingredients and knead with the dough hook until the dough comes together in a ball and becomes elastic. The dough was still sticky after it was elastic and it seemed about as firm as I wanted it to be. It's common for some doughs to be sticky even after they're properly kneaded, so I wasn't worried about that, but it did make handling a little messier. 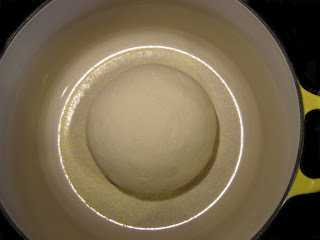 To form it into a ball, I floured the counter top and gave the dough little bit of hand-kneading, then formed a ball, put it back in the bowl, drizzled with a little olive oil to coat the ball. I covered it with plastic wrap, let it rise until it was doubled in size, then took it out of the bowl and reformed it into a ball and put it back into the bowl for a second rise. After the second rise, I formed it into a ball again, then sprinkled some cornmeal at the bottom of my cast iron dutch oven, and put the ball into the dutch oven and put the cover on. After 20 minutes, it had started to rise nicely. I put the pot into a cold oven, set it for 400 degrees, and set the timer for 60 minutes. When time was up, it wasn't quite brown enough, so I uncovered it and let it bake for another 10 minutes. I took it out of the pot and let it cool completely on a rack. The bread was a pale brown with a nutty taste from the sunflower seeds, and some texture, but it wasn't overly crunchy or dense. With lots of fiber from all those whole grains. So I guess overall, it was a good mistake to make. I think that I might try it next time as-is, then another time cook it before adding it to the dough, and then grind it into a flour for a final version. This should be fun. Home made fresh pasta is simple enough, but it's more fun with gadgets. In this case, it's the Pasta Press attachement for the KitchenAid stand mixer. The press makes spaghetti, rotini, and several sizes of hollow pasta including buccatini and rigatoni. The press attaches to the front of the mixer and it extrudes pasta in a variety of shapes depending on the die you use. Sort of like a cookie press, but pasta dough is much stiffer. This recipe is based on the Basic Egg Noodle Pasta recipe in the booklet that came with the Pasta Press. But really, pasta is something you can make without a recipe if you know what the pasta dough is supposed to feel like. Traditional recipes start with a pile of flour on a countertop. You make a well in the center of the pile, then one or more eggs go into the well and are slowly mixed into the flour until it's a dense dough. While you can roll out and hand-cut softer pasta doughs, I've found that the pasta machines work better with a denser dough. It should come together and be kneaded, but it's not soft at all. It more like a really chilly pie crust dough than like any sort of bread dough. The flour and salt went into the bowl of the stand mixer with the paddle attachment. I added the eggs slowly, plus enough water to moisten all the dough. Moist, not wet. Then I put in the dough hook and let it knead for a few minutes. It was still a bit crumbly and not together, so I took it out of the mixer and hand kneaded it into a cohesive lump that was smooth. Then I attached the pasta press with the spaghetti die, and started extruding. It's easiest to break the dough into small lumps and let them feed that way, rather than trying to push a larger piece through. I cut them off and hung them over a dowel that I had hooked over my kitchen cabinet knobs. I wasn't trying to dry them, but it seemed to be the best way to keep the strands separated before they went into boiling water. I boiled them in salted water. The noodles floated, so I needed to stir now and then so they'd cook evenly. When they were just about done, they went into a pasta sauce for the last seconds of cooking. Breadsticks can be made many different bread recipes. This is one that works really well. They're light, crisp, crunchy, and very tasty. And the sesame seeds add their own flavor. The first five ingredients went into the food processor, and while the processor was running, I poured in the water as fast as the flour could absorb it, and then kept processing until it was nice and elastic, stopping now and then to check the dough. I use instant yeast, and I buy it in bulk and use it often, so I had no doubt that it would activate during the process. If you don't use instant yeast or you aren't sure if the batch you have is good, you can add the yeast to 1/4 cup warm water with a little of the sugar added in, and wait to see if it foams up. Add that to the food processor first, then follow with 3/4 cup cool water. The reason cool water is needed here is that the action of the food processor blade heats up the dough. If warm water was added, it could get too warm and kill the yeast. I used about a quarter of the dough right away for something else, and put the rest in a plastic bag in the fridge, drizzled with a little olive oil to keep it from sticking to the bag. It sat for two days in the fridge, but that rest isn't necessary. The breadsticks can be made immediately, or you can let the dough rise once, for a little more flavor. I preheated the oven to 350 degrees, with the convection fan on. I let the dough sit for about 15 minutes to take off some of the chill, then rolled it to a rough rectangle, about 12 x 15 inches. I sprayed in with some Quick Shine and sprinkled it toasted sesame seeds. I rolled over it with the rolling pin to press the seeds into the dough a little more. Then I cut it in half lengthwise, and then cut strips about 1/2 wide. If you don't have Quick Shine, you can brush the dough with an eggwash, Or, if you're not using seeds that need to stick to the dough, you can skip the eggwash. I twisted each strip before I put in on my breadstick pans. These are corrugated pans that keep the sticks straight and keep them from moving around. Breadsticks can be baked on regular baking pans. as well. When twisting the sticks, they will stretch, which is why I start with shorter pieces. I ended up with three pans full of breadsticks, and baked them all at once on three racks in the oven, moving them around to different oven positions during baking, so they'd brown evenly. Yes, that's right. Twist them, put them on pans, and bake. No rise. Really. After about five minutes in the oven, they've risen nicely. They baked for about 35 minutes, but I was checking every five minutes or so after about 20 minutes. These can go from pretty golden brown to overbrowned pretty quickly. But you want then cooked through so they're crisp. If they're not baked until they're dry they can be chewy, but not in a good way. After baking, they need to cool completely before storing. I did find one very interesting gem here in Colorado. - Marcos Hot Dogs. Grilled, bacon-wrapped hot dogs, topped with beans, tomatoes, mayo, onions, ketchup and cheese, with add-your-own extras including hot sauce, relish, grilled jalepenos, and pickled jalepenos are hard to beat. Hard to believe, but we still had corned beef left over from my ahead-of-the-holiday cooking...and today I decided to do something completely different with the beef and the last bits of veggies. So it all went into the meat grinder. Yes, the meat grinder. Because, why not? I'd never tried putting cooked meat through the meat grinder, so that was good enough reason. I had enough to make 4 burger-sized patties. I put them in a nonstick pan with a little oil and let them brown well on one side. They were still a little soft and a bit tricky to flip, but they didn't fall apart. After the second side was browned, they held together a lot better. The texture wasn't like a burger, it was more like salmon patties. And the color was a similar pink. They got a nice brown crust, which was nice. If I make them again, I'll probably add some bread or cracker crumbs so they bind better, and maybe some chopped onion or scallions. The mustard way a nice touch, so I'll keep that. This is a really simple bread, but the method is a little different. In some ways, it's easier than that other easy bread (I'm looking at you, no-knead) except for the kneading part. You do need to knead. But if you've got a stand mixer or a food processor, the machine does the work for you, so kneading isn't a big deal. If you don't have a machine to do that work, kneading a bread like this isn't a huge effort. And this method gives you a nice loaf of bread that you can eat the same day. Put the first 4 items in the bowl of your stand mixer, stir, and let it sit for ten minutes, until it's foamy. Add the flour, salt and olive oil, and first mix, then knead on medium speed until elastic. Form into a ball, drizzle with a little olive oil, put it back into the bowl (or another clean bowl. Cover the bowl with plastic wrap, and let it rest until it has doubled in size, about an hour. When it has doubled, take it out of the bowl form it into a nice tight ball. Sprinkle some cornmeal on the bottom of your dutch oven (I used a 5 1/2-quart). After fifteen minutes, you'll see that it has started to rise. Put the pot into a COLD oven. Set the temp to 400 degrees.